Day 8: Santillana del Mar to Comillas — The directional signs to leave Santillana this morning were non-existent, leading us to speculate that the town was trying so hard to be authentically medieval that painted yellow arrows, the key to pilgrim directions, were forbidden. How else to explain that two walks up and down the village’s streets this morning did not reveal the way out of town? Last night I’d had a nice dinner with John of Calgary, then had headed straight to bed, somehow finding sleep amidst the giggling of my five female Spanish roommates. After their quiet departure at 5:30 am I couldn’t get back to sleep, so I gathered my things and headed out the big, black, steel albergue gate. Here I joined two Italianos and a Maltese pilgrim as we walked up and down the street, hoping for a hint of the way out of town. Finally we all headed out the car road, in spite of the yellow “X” (meaning it was not the pilgrim route) and walked along the highway first to Orena, then to Caborredondo. The others chose to stay on the highway to Novales while I found the official pilgrim trail and its very welcome yellow arrows. Before Cobreces I returned early to the highway to find breakfast and waved to the Italian/Maltese contingent who somehow I’d beaten to this point. 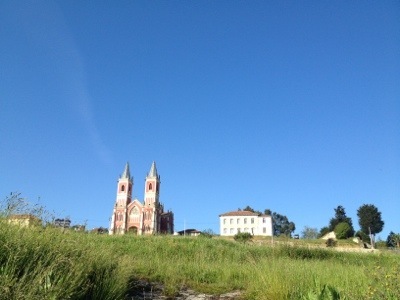 I then missed the pilgrim trail and stayed on the highway most of the way to the pretty town of La Iglesia. From here the camino wound on small roads through the tiny villages of Pando and Concha, then finally climbed a rise and revealed Comillas in the distance. I crossed the bridge into town, then walked up to the winding streets at the heart of this medieval town. After a few tries at finding the albergue I finally located it and set my pack on a bed to reserve it so I could head out for some lunch in the shade. 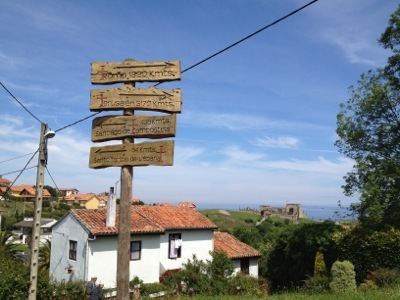 A sign outside the albergue described an unsettling fact: Santiago de Compostela is still 456 km (280ish miles) away. I’ve managed about 160 km +/- in the last 8 days, though I’m actually two days ahead of schedule. Perhaps it’s the early arrival here, though, that’s made me feel I’m not maintaining a quick enough pace. But Comillas holds some interesting sightseeing treats, so it would be a shame to rush along and miss them. I wrote emails at a cafe in the plaza and planned my assault on the main landmarks of this touristic, medieval seaside village. Spanish and German tourists sparsely inhabited the square and there was a relaxed feel to this town that records its beginnings as a Roman mining center over 2000 years ago. I watched from a distance as a few other pilgrims arrived and looked for the albergue, including John of Calgary. I wanted to tell them where it’s at, but shouting across the square or jumping up to run and catch them didn’t seem quite right. Instead I ordered a round of huevos fritos and patatas fritas and decided to make this my final meal of the day. After awhile I headed back to the albergue where I may have lost my first argument in Spanish. The hospitalera’s boss came by the albergue at 2:30 and discovered pilgrims inside prior to the 4:00 opening. She was offended and loudly complained although she wasn’t about to throw anyone out. I tried to explain to her that in 2200 km of caminos I found it customary for pilgrims to enter an unlocked albergue and choose their bed. She wasn’t satisfied to hear that but I was pleased to engage in my first, albeit unsuccessful argument en Espanol. The hospitalera soon arrived and collected our money as per normal. I chatted briefly with the Spanish women from last night then took a tour of the Palacio Sobrellano, a lavish home built by a Catalan noble on one the town’s many hills. A glass or two of wine with John, then off to bed. 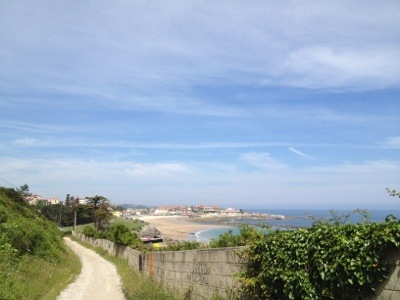 This entry was posted in Camino del Norte 2012 and tagged Comillas, Santillana del Mar by SandyBrown. Bookmark the permalink. 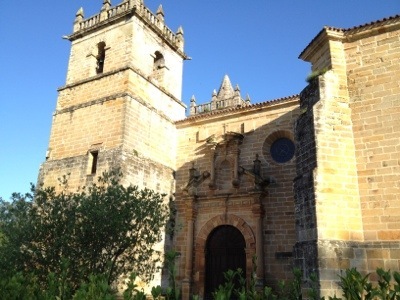 My CSJ guide saw us leave Santillana very easily and a great route into Cobreces, we were also well ahead of schedule. Did entire route in 29 days. Hope you getting good weather, lots of rain here in ireland again. Is the CSJ book the one by Walker? I’ve heard mixed reports of the Walker book. I’m glad that you’re getting the opportunity to get to know some of the places that you’re visiting! Enjoy it! Hey Sandy, I am about to walk your exact route in 3 weeks, and am trying to decide on footwear. I bought a pair of Salomon Quests, which I saw on the forum that you endorsed. I also noticed that you aren’t wearing them on this trip. Do you feel that they would be appropriate for the Norte in June/July? The Salomons are great boots and will work out well for you, assuming they fit correctly. A few months ago I visited a foot specialist who advised me to either go up a size or find a boot that is wider at the toe, due to the unique shape of my foot. The result are my current Treksta boots which are working out fine. But like I say, the Salomons are great if the fit is right for you. Buen camino! 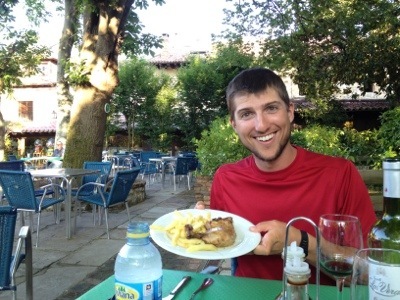 Thanks for sharing your experience on the Camino. I plan to walk this in 5 years, but enjoy reading your adventures. Buen Camino! !